The disappointment of a squandering a winner against Koloale last weekend might have played a role in the win but the shine in Commins Menapi’s star studded line up is yet to show. 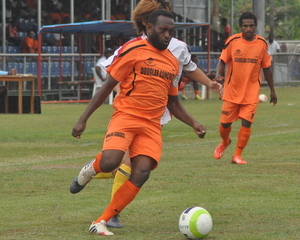 Now they rest atop the league ladder but the win was no walk in the park for Western United. Western United took the lead in the first half with Benjamin Totori walking a neat pass across the box for the running Gagame Feni to finish and he did so with finesse despite having two FC Guadalcanal defenders hot on his trail. Western United were much more organised in the second half but they were faced with stubborn defending from FC Guadalcanal. At the same time, FC Guadalcanal were enjoying very little luck at the other edge of the park. Totori added the second goal with 20 minutes left on the clock with a neat effort past Thomas Malata who was otherwise excellent in goal. However, the euphoria on the defending champion’s bench was short lived as substitute, Martin Ruhasia headed home a corner kick just three minutes later. Ruhasia’s goal returned proceedings to a one-point game and encouraged his players to try to claw away something from clash. However, this was not to be as the referee called the match to an end and Western United escape with all three points.